First finish of 2017 - hooray. If I'd applied myself more diligently this might have scraped in at the end of 2016, but I didn't. That's the way it goes sometimes. This had a working title of Circles, but given that I've used this for at least three quilts recently it needs a better title, so I am calling it At the Edge. This is taken from a quote by A.S. Byatt, in an interview on The Art of Fiction for the Paris Review. You can read it here and it's well worth the visit. It's a long piece and the section on language and colour is quite a long way through it, so I guess if you didn't want to read it all you could just scan through for the relevant section. Anyway, she says "I think the names of colors are at the edge between where language fails and where it’s at its most powerful". I like this a lot in itself but it seems particularly appropriate given that I started this piece with a desire to use the colour definitions from Webster's. Crumbs - that's the most long-winded justification I've ever written for a quilt name! And a slightly closer view, just because I like the patterns the quilting has made on the back. A little bit of binding. And here it is on a bed. I should point out that this is an extremely large bed, so the quilt would come down the sides on a standard double. Pieced entirely from Oakshott shot cottons and Kaffe Fassett striped fabrics. Binding: more of the stripes. Wadding is wool, probably Hobbs Tuscany Wool, though I honestly don't remember. Quilted using a selection of Sulky 12 variegated cotton threads - I just used what I already had, which turned out to be quite a lot. I started piecing this on 13th January 2016, finished on 1st April 2016. Started quilting on 16th October 2016, finished today, 10th February 2017. This quilt is gorgeous!!!! Congrats on beautifully finished quilt! I love this, there's a beautiful simplicity to circles. Spectacular -- I can only imagine the textures in person. Truly wonderful! Between the wool and the shot cottons I bet this feels amazing. And I love the quilting design from the back too! Beautiful finish! An auspicious start for 2017. Lovely! Congrats on a very pretty finish! Stunning - the quilting is wonderful too. This is a beautiful piece! Truly stunning! Congratulations on your first finish and quite a finish it is! Absolutely beautiful! Stunning - nowt else to say - just Stunning! So many things to say about this beautiful quilt. Fabulous combinations of colors front and back. Love the layout and the quilting. I'll be back to look at this frequently. Congratulations. Great use of color and circles! A wonderful quilt. I have loved this quilt since you began the first few blocks, the two fabric lines go together so very well. Congratulations on finishing such a beautiful quilt. By the way, love the hanging set up! A beautiful quilt! So rich looking and heaps of lovely quilted texture! It's GORGEOUS! I love those colors and the design you chose is perfect. What a wonderful, colorful quilt. Love how you quilted it. Oh, this is gorgeous! I love all that hand quilted texture, and the circles, and the colors, and the words, and everything else about it. Congrats on this finish. 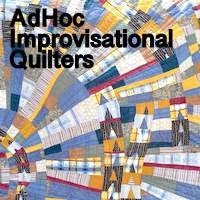 And a fun way to name a quilt too! Such a beautiful bright quilt and well worth the wait I day. Thank you for linking with TGIFF! Fascinating piece about the relationship between color and language. (To think how that gets more complex between languages--it boggles my mind. And how would one ever describe those color-shifting shot cottons?) Thanks for sharing that and how it relates to the name of your quilt and your printed color definitions. I've said this before, but I love to see your finishes because they include the back, too. This one really shows off the dense, lovely quilting. Awesome. Can't say much more. Fascinating colorful design and quilting. I really love how it shows up on the back. Just beautiful! Hooray for the year's first finish! Ps, I can't type on my phone, haha! I am in awe of your hand quilting! This is a big quilt!! and beautiful. Beautiful! I love the stripes and circle combination. Beautiful. I love the strips and circles too! Just stunning - love it all!!! Wow - what a gorgeous quilt, and hand quilted too! And here I am still slowly making the blocks. Love the quilting pattern you chose, and I am glad to enjoy this journey with you. Yellow birds, done for now.